I love this! I am adding this to my pinterest of Vacation Home ideas! Is the shower across from the toilet? You did not show it. This is THE most beautiful bus conversion EVER! Just beautiful! WOW! Definitely had me swooning on this one! Very beautiful! 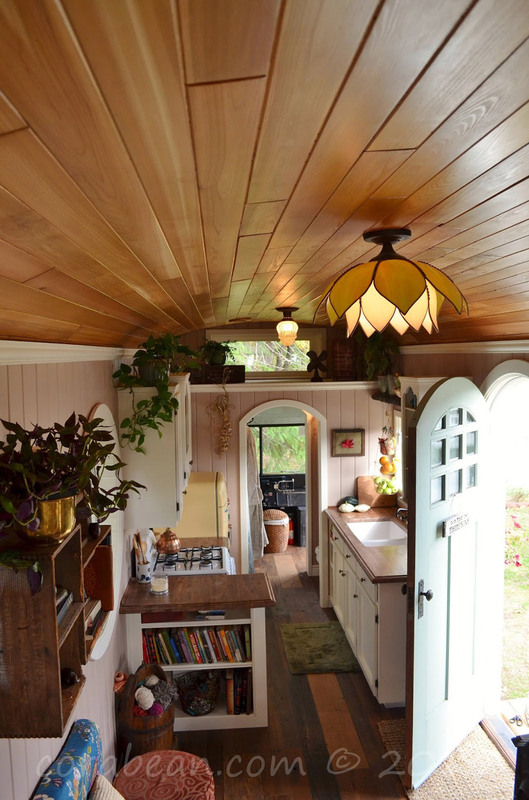 I’m usually not a fan of bus-to-house conversions, but this one blew me away! I love it!!!! Wow! Amazing transformation! The bus mostly disappears with this conversion. I love the alcove bed, if that is what its called. the bookcase, the fireplace, the round window. But why does the toilet have no curtain for privacy, and where does the kid sleep? the bench looks too narrow to sleep on. Is that a family bed? This may be a silly question, but can this bus be moved or was just the shell used for this TH? Normally, I wouldn’t care for this type of a build, but it is so well done I just have to give it a two thumbs up! From what it says on their website (link at bottom of post), it can be driven but they plan to keep it in a permanent spot. I’m super impressed that the bus is still functional after such a total (and GORGEOUS) makeover! Devan, what kid? 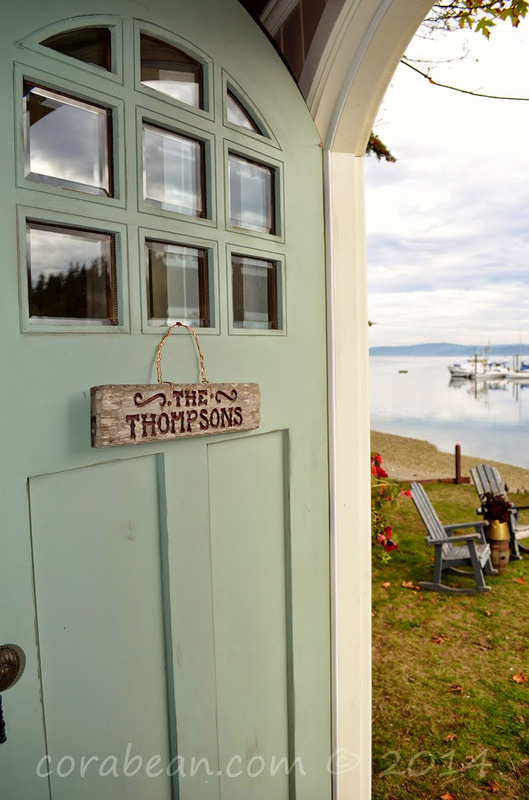 Are you referring to the child of this tiny house owner’s SISTER, who is the one who wrote the blog post and took the photos? I think it’s gorgeous, creative, and oh so unique with true artistic touches! Also, people need to read the details…these photos were taken back in Oct at their “open house”, BEFORE they moved it to their land to live in permanently. People are making the assumption that just because there wasn’t a curtain closing off the toilet that one wasn’t added later, prior to full-time living. I would have to say you were talking to me. My apologies for mistaking they had a child. I skimmed the captions on the blog and still thought they had a child. I could swear I saw this bus/house on tv. I thought they had lived in it for a while now, It looks like they have well moved in, I just didnt see a rod over the toilet. Denise, it was easy to assume that there was a kid as there’s a kid’s picture above the toilet and there was no story on this post, just a link to the original blog. SC’s comment didn’t seem to be judgmental, and in fact praised the construction. Jessica answered her questions with respect, which is something you could work on in the future. 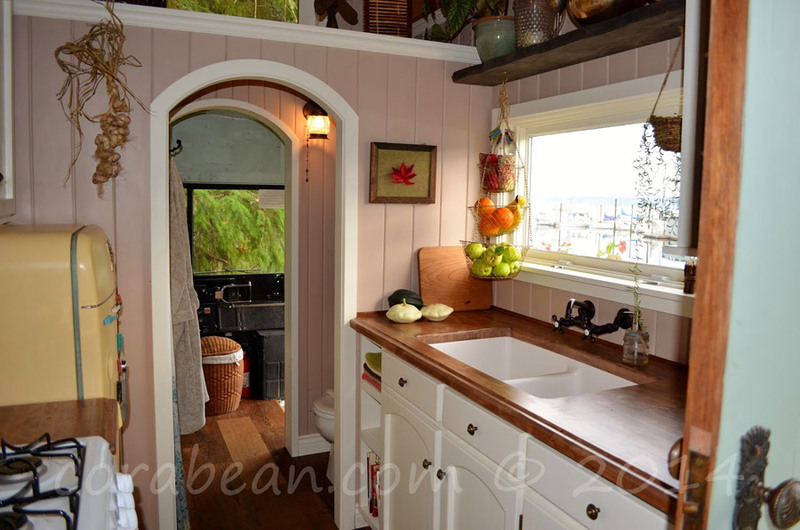 The Cora Bean blog says that two people designed this beauty, but who actually built it? And is there any way we can find out the cost? This gem beats any RV by a mile. I want one of my own! This quite simply is truly lovely! There is SO much to love about it….. the reversal of bed and sitting so that bed is on the bottom with plenty of head room etc and loft is for sitting area, the windows, pressed metal behind fire/heater, use of timber in ceiling, the use of white paintwork and timber….. I could go on and on! So very nicely done! This is the coolest bus I have ever seen. What a wonderful little home – the details are so cute and welcoming. It is just perfect. So much charm and character. I hope the Thompsons are happy and healthy and living the best life. This one makes me drool!! I love the rounded arch theme throughout. 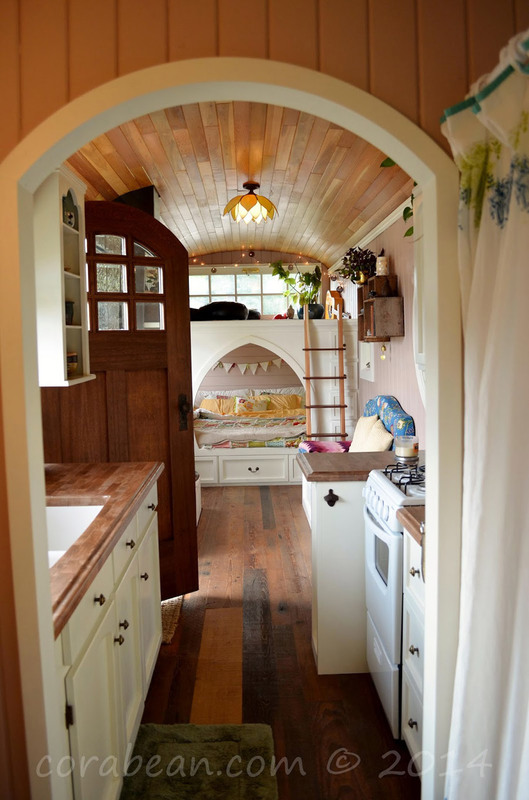 This is one of the best tiny houses I’ve seen yet (quite possibly even the best). If I ever decide to build my own this will certainly be my inspiration. There is a fantastic attention to detail. The best are the rounded archways and the rounded opening for the cubby bed. For laundry, do you hand wash or go to the laundry mat? 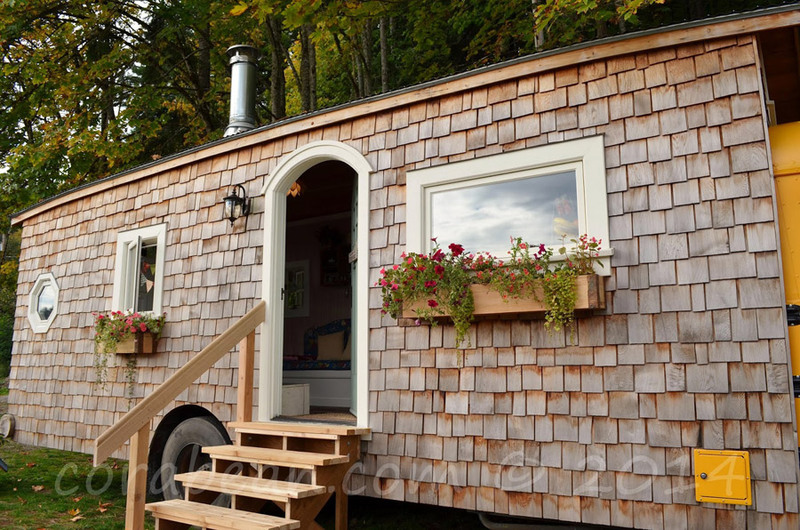 Agreed: this is truly one of the most wonderful of tiny houses. Would love to see an update on this project when the home has been sited and is being occupied. My wife and I are planning to live at least part time in an rv or bus conversion. This is one of the most comfortable looking designs I’ve seen. A shame commercial rv interiors are so cheap/outdated feeling, even brand new. Thanks for the inspiring post. I come back to look at this time and again. The most beautiful/creative design I’ve ever seen. Hello, love the work you did, I was wondering where you found your vintage frig ? Absolutely love everything about this one!!! 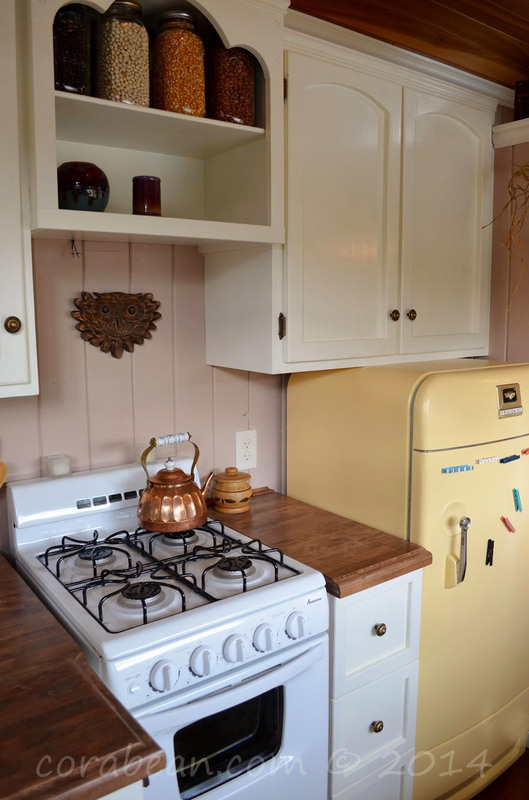 I am dying for the vintage looking fridge!!! 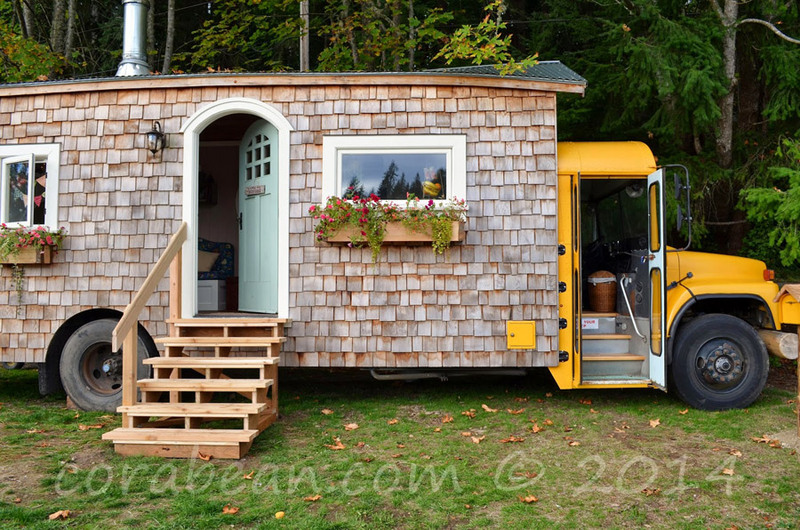 One of the best I have seen of all tiny homes! !